Swedes face one the world’s highest tax rates. And apparently, they want to pay even more than they owe. Last year, Sweden’s budget surplus totaled 85 billion kronor ($9.5 billion), around half of which came from people and companies overpaying tax, reports the Financial Times (paywall). It’s not that Swedes are unusually generous. Rather, this peculiar habit stems from the weird ways negative interest rates warp incentives—in this case, making it more beneficial to overpay taxes than keep cash in a bank or savings account. 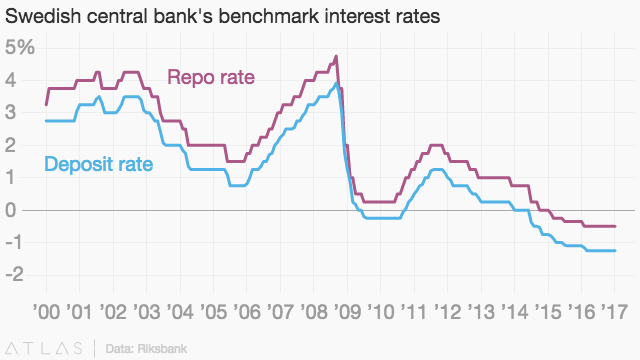 For years, the Swedish central bank has steadily cut its benchmark interest rates further and further below zero, in an attempt to stave off deflation and prevent the krona from appreciating too much against the euro. Since the rates banks offer to savers track these benchmarks, that has left people earning little to nothing on their bank balances, and some companies facing charges to park their cash at the bank. Bond investors, meanwhile, pay for the privilege of lending money to the government and blue-chip companies. The Swedish government, meanwhile, pays 0.6% annual interest on excess deposits in tax accounts. Given the lousy rates on offer from commercial banks and asset managers, these relatively lavish returns have encouraged Swedes to pay more than they owe in taxes—the government will eventually return the balance, with interest. We’re not talking small change here. Last year, people overpaid their taxes by 40 billion kronor. As the Swedish government protested, this “involuntary borrowing” from taxpayers will cost it 800 million kronor more than if it raised the same amount at market rates, according to the FT.
Sweden is not the only country where negative rates have led to strange behavior. The Swiss rushed to pay taxes early in order to get a bonus rebate that was better than interest offered by banks (paywall). In Denmark, some banks are paying homebuyers interest on their mortgages (paywall). Japanese savers are buying fancy fire-proof safes to store cash over fears their banks may levy charges on deposits. A huge share of government bonds issued by advanced economies pay lenders less than face value; the European Central Bank itself is a big buyer of these guaranteed money-losers.